A few weeks ago, I received the Leapfrog Bolt for intensive testing. Besides a lot of very positive things I have only a few minor points of criticism. What I enjoyed most were the two independent extruders: the air filter and the good print quality. The Leapfrog Bolt is being delivered on quite a big palette. Together with the packaging it has a weight of 110 kilograms (220 pounds). After removing some screws, I was able to lift the top of the packaging (it takes two people for this). Pictures on the side of the package show where and how to remove the screws. Then you can already move the Bolt to its final position. Due to the heavy weight (70 kilograms or 154 pounds) you should do this at least with one other person. A small hint: Don’t underestimate the size of the 3D printer, it’s quite big. The dimensions are of 723 x 832 x 801 mm (DxWxH). Before bringing the Bolt to its final position you should think about the right height to place it. Placing it on top of a table or desk is not ideal because you can’t access the touchscreen very well. On the other hand, when you place it on the floor it’s very uncomfortable to remove the printed parts. The only good workable solution is to place it at an height between the floor and a table. Apart from that, the Bolt features solid mechanics. The linear rods for X and Y axis are very stable and the cable management has gained my trust immediately. Of course you can expect that from a 3D printer that costs around 6,000€ (including VAT). After the first start-up the touchscreen guides you through all important points of the installation. I assume that a Raspberry Pi works as the main computer (but that’s only a guess from my side). Anyway, the touchscreen reacts pretty good and fast, I had no problems using it. Sadly, the wireless connection seems to be a little bit blocked by the case of the Bolt. Other devices like computers, tablets, smartphones but also a Raspberry Pi with a cheap WIFI stick were able to receive the signal. The Bolt was not able to receive it; only after placing a WIFI repeater in between the Bolt and the router it worked. 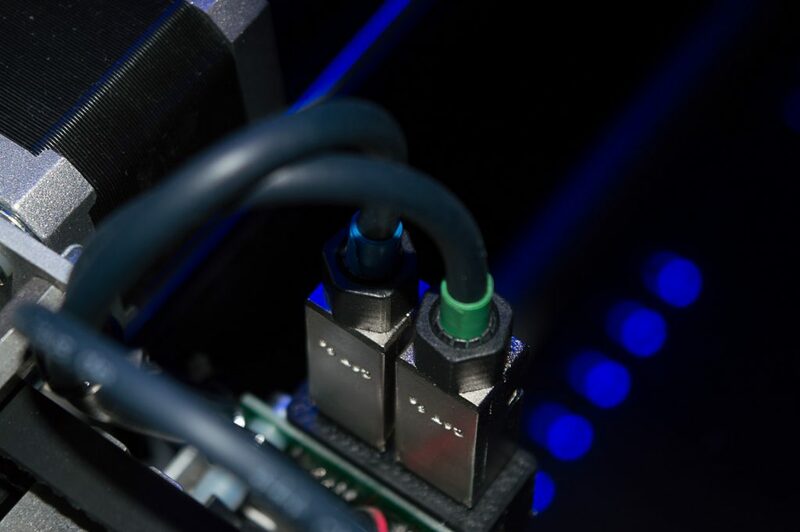 As an alternative, there is also a LAN connection which won’t make you any troubles and should be preferred for all static connections anyway. Very convenient was the inbuilt webcam. You can create time lapses with of your prints and, more important, you can control the printing process from other rooms over apps or the web interface. Internally the software used is the open source software Octoprint. When you want to create time lapses you may not be very happy about them. That is due the blue LED lighting on the inside, which makes all objects look blue, even if they’re not. The print bed can heat up to 90 degrees Celsius and with the delivered spray all materials stuck good to the print bed. It took several minutes until the bed hit the 90 degrees. As a side-effect the air inside the printer heats up too. The print bed’s height itself can also be adjusted using three screws on the bottom. Something like “Live-Z adjust” was not possible using the touchscreen interface. The most advanced and pretty unique feature of the Leapfrog Bolt are the two in depended extruders that move on the same axis. In doing so they are driven by two stepper motors. It’s actually also possible that they collide but thanks to the right software that has never happened during the test. With the two independent extruders, it’s possible to print two of the same objects parallel to duplicate the printing speed and use half of the build area. Alternatively you can work with two different materials like ABS and PVA or different colors. Starting my tests I tried to print the standard Benchy with the delivered blue PLA filament. After about 10 attempts with lower quality I decided to contact the support team via e-mail. Following some very friendly and quick answers and a couple more attempts the quality was indeed better, but still not as good as I would prefer it to be. That’s due to the closed build area of the Bolt, as the PLA was not able to cool down as fast as needed, especially during printing very small or complexly shaped parts. What may help is printing more than one object at the same time or using other materials such as ABS, which just printed perfectly. Does this effect cause any problems during daily use? It depends on the material and the object size you want to create. When printing larger objects or using other materials (ABS, PET-G, …) this problem won’t effect you at all. In fact, the closed build chamber causes the temperature inside to rise to 50 degrees Celsius (22 degrees room temperature and build plate heated to 90 degrees), which is very beneficial for printing with ABS. In general ABS smells “not so nice” when 3D printed and may also be harmful to your body. The inbuild filter reduces the bad smell when printing ABS, but it was not able to remove the smell completely, so there might also be still some nano particles left in the air (we have not measured this at all). Nevertheless, it seems to be much better than printing with open 3D printers without any filter or casing at all. 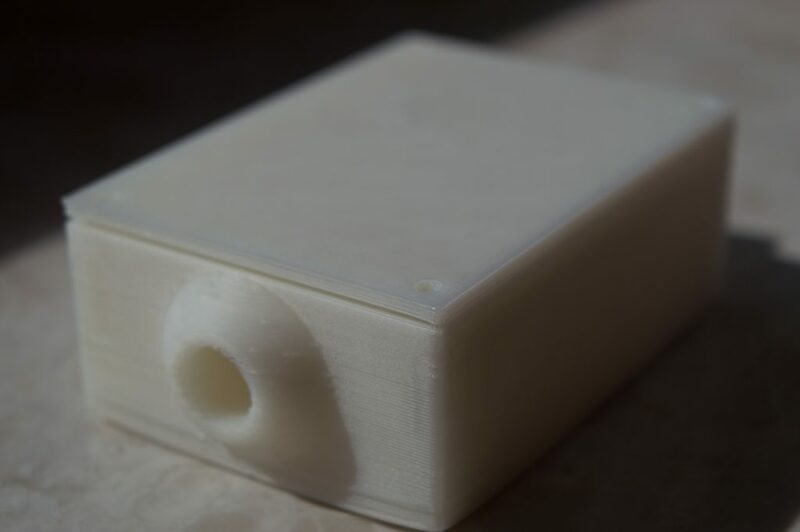 As expected the print quality with ABS was perfect, warping was not an issue at all. Bigger objects in PLA also printed very well without optical defects, flexible filament (Primalloy) was not a problem, PVA worked fine, PET-G came out pretty decent. Also, the function to change the filament is made very nicely and worked every time I used it. Another software feature may be very useful for you: the printer calculates how much filament was already used so you can better decide if there is enough filament left for another print job. The Leapfrog Bolt has some special features like the air filter, WIFI, touchscreen and two independent extruders that can work parallel. The implementation of some details is not 100% perfect, what makes my overall impression not as high as it could be. However, the Leapfrog Bolt does it job almost perfectly: it prints objects out of different filaments with a good print quality. 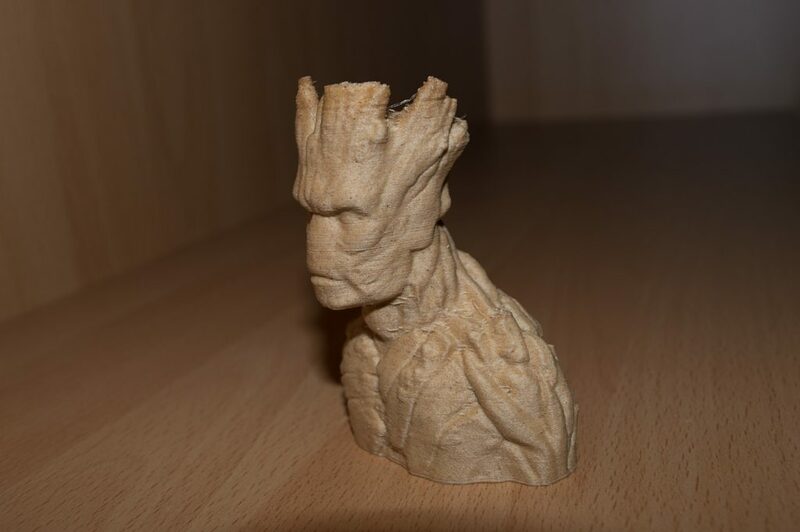 This is a copy of the original review 3Dprintr.com made on the Bolt 3D printer. For the original article, click here. Read the German version of the review here.